Preheat grill to high. In bowl, whisk together lime zest, juice, 3 tablespoons honey, garlic chili sauce, and salt; set aside. Cut watermelon into 1-inch thick wedges. Lightly drizzle each side with remaining honey and place on grill. Grill until just browned, about 2 minutes per side. 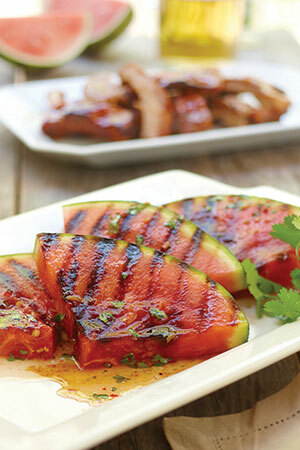 Place watermelon slices on a plate and drizzle with lime dressing. Garnish with cilantro. Photos and recipes courtesy of National Watermelon Promotion Board.